Q. 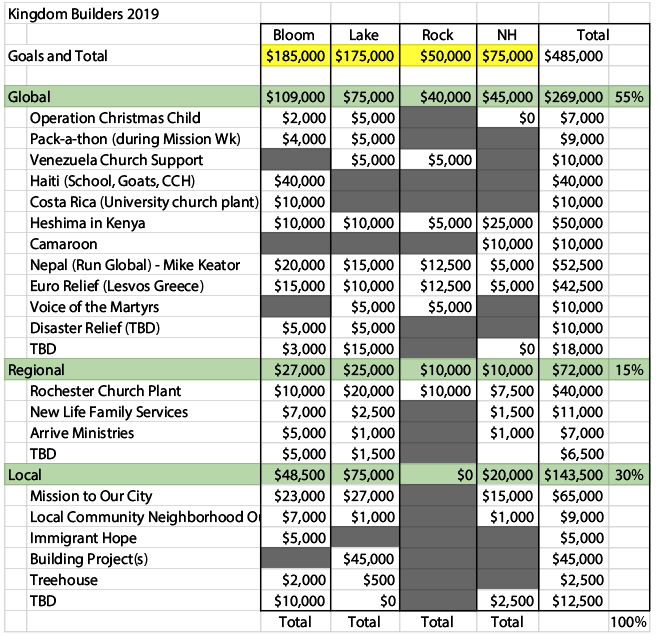 Who determined what activities and projects were included in Kingdom Builders in 2019? A. The pastors of each location set their own goals, objectives, and budgets based on what they believe would be best for their location in the 2019 calendar year. Q. How will the money be divided among the location goals? A. In 2019, each location has their own goals and budget that they will be working towards. Some of the initiatives are more location specific while others are more collaborative. At any time during Kingdom Builders, a location may choose to assist another location with their initiatives. Q. What happens if the full goal amount is not raised? A. The location pastors have prioritized their initiatives. If the goals amounts are not raised, they will determine which initiatives are done and which are not. Some initiatives may still be completed, but in a less expensive manner than originally planned.